Oh my, did the Winter Hag hit us last night. In Central Ohio we got I don’t know how many inches of snow- which would be fine- except we got solid ice underneath it first. I can’t walk my dog in certain parts of the grass or we will slide away! The plows, salt trucks, and sidewalk clearing is in full swing. I only had to shovel my front stoop, as a neighbor shoveled the walk before our helpers got here. Not bad, but I am aching all over- as it’s only 8 degrees, and my body revolts against the cold. There is ice frozen inside of our vintage 1970 windows, and I am wearing double layers and sitting under a blanket, as is the dog. The cats are sound asleep, and while I have a cup of hot mint with black tea, my husband has started his coffee ritual. We all know what that means. Nothing happens before coffee! There is beef stew cooked already for supper, and we will probably make some tacos as well. I am sore, exhausted, and I know it’s due to the cold. I am one of THOSE people. This weather has knocked me out. I am more than in the mindset to think about Spring. I’m thankful we are close to another turning of the Wheel, and I look forward to when I can hear more birds singing, and I can see the thaw, and the wildflowers poking through the forest floor. Possibly one of my least favorite Sabbats- because it is bloody cold, Imbolc is both a blessing, and just another stepping stone moving us towards warmer days, and the growing season. Halfway between Winter Solstice and Spring Equinox, it was traditionally celebrated in Scotland, Ireland, and the Isle of Mann. In a nutshell, the animals would be lactating, or producing milk, so people had a feast, thanked their gods, and had a good old time. So, it was, and is a seasonal harvest type celebration, but it was so much more than that. It was celebrating the goddess Brigid. Ceremony was used to ask her to come into the home to bless and protect the people and livestock. Beds so she could accept hospitality would be laid for her, and special foods set out. Everybody wanted the goddess to come into their home and protect them and guide them into the coming Spring. Winter is a scary time. Even today, ice can knock out electricity, and what if you can’t even afford electricity? It’s cold! Reports of the poor and homeless freezing to death are in the news every Winter. Imagine how much scarier it used to be hundreds of years ago, and how grateful people were for both the milk, and the thaw which heralded the fact Spring would indeed come. The Wheel was and is turning again, and people are very very happy about that. But while Brigid might be a goddess of light and life, some would say in Winter, she is her hag aspect. She goes by different names depending on what part of the British Isles she is being talked about. For some, she’s Beira, and she washes her plaid on the Loch until it is pure white, and she spreads it upon the land, making snow. For some, she is called the Cailleach. Beira uses her hammer to make mountains and valleys, and uses her staff to make it cold and wintry. She rules from November 1- Samhain, to Beltaine- May 1, and she is VERY resistant to give over her rule to Brigid, who rules from May 1- to November 1. Some even say she gives power to Brigid as early as Imbolc although some say it’s as late as Beltaine. Some say the early Spring snows are Beira’s way of trying to stay in power! In many ways these stories express human beings way of trying to explain seasons before modern science, but in many ways, they express the duality of our own lives as well. Who among us has never been a vivacious, lively person one moment, only to endure a period of personal darkness, tragedy, or illness? Just like the goddess. As for many of us the goddess IS the earth, these stories speak to us. When it’s the warmer seasons, the goddess- aka earth- produces abundantly. Like in our own lives, when all is well and we are at our best, we are more capable, and get more done successfully. Likewise, when we are sick, suffering, sad, or just upset, we are not at our best, and fall fallow- like the earth, or the goddess in Winter. As my memory is not what it used to be, and I have done a LOT of reading over the years, I cannot pinpoint exactly what stories express what I am about to share. But I have read many stories about people hearing a knock at their door in the night, and an old hag asks hospitality, sometimes just to warm herself at their fire. In the stories, it turns out this is no ordinary old woman, but either a powerful witch who blesses the family if they are kind to her, or curses them if they are unkind. In some stories, it’s the goddess coming for a bit of comfort. The moral of these stories is not so much to try and be rewarded for all the good we do, but to remember those who are struggling, who need our help. Also, you never know who somebody who looks to be a down and out old bag of nothing actually is. Everybody is important and deserves comfort and alleviation of suffering. Let us never forget there will come a day when we, too may be that pitiful creature begging for hospitality. One of my personal heroes was Mother Theresa, who, to me, was a living embodiment of the goddess. At a young age, she chose to work with the poorest of the poor because she felt her god called her. Her Sisters in Calcutta are world famous for their compassion and determination to grant comfort and love to those who the World seems to have forgotten. 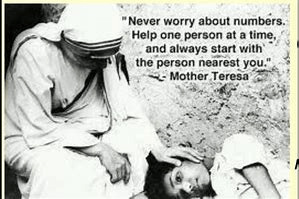 Mother Theresa wrote about tending the body of Christ, HER god. She said by doing for others, you touched, blessed, and tended the body of her god. I saw the Goddess in her Winter Hag form at a grocery store this week. She was in a “Distressing Disguise”. She was sitting by the door, waiting to be picked up, as many elderly people do- and she had her nose and mouth wrapped, and her hands tucked into the sleeves of her coat. I could see she had on no gloves. She was old, bent over, decrepit, cold, and suffering. She needed a little comfort. Was she a celestial spirit? No. She was merely a human being, but women are the physical embodiment of the Goddess in the same way people are the physical embodiment of the body of the Xtian god for people like Mother Theresa. Instead of a Sabbat ritual, I have a suggestion, a plea actually. Would you be able to find the time to tend to the body of the goddess in her distress? Can you welcome the hag into your home and heart, and celebrate her in her struggles as well as glorifying her in all her splendor? Keep this as a regular practice, not just something to do for Sabbat. This is not a ritual, but is a set of things to keep in mind. We all need one another and sometimes forget, or don’t know how to ask for what we need. Set an intention to keep tabs on those who are sick, isolated, depressed, sad, grieving, old, or just alone. This extends to your loved ones who are overworked and do not have time for a social life as well. People who are easily forgotten because they are not nearby are the ones who need to be checked up on the most. Remember that YOU are sometimes the one who needs care or help. Do NOT hesitate to ask for what you need. We are in one another’s lives, and together, life is better. Be compassionate and patient with yourself. If you feel frustrated with yourself for whatever you are struggling with, ask yourself if you would be harsh with somebody ELSE struggling with this? Of course you wouldn’t! Remember to be healing, patient, and loving to yourself as well as others. Holiday time is especially difficult for those who are alone or struggling somehow. They feel like a third wheel at gatherings, and may forego attending for not only that, but if they cannot afford to contribute, they may feel embarrassed. Think of ways to make them feel comfortable coming, and reassure them. You may need to arrange transportation and take somebody home early. People who struggle may not be physically capable of staying the whole time. Make sure they know that is okay and they won’t be stuck trying to be presentable when they need to leave early. On the other hand- be understanding if they just need to skip out. Don’t make them feel attendance is mandatory. Let them do what they can do. Learn to listen. I cannot tell you how many family members of sick or elderly people I have heard spout off about “I JUST don’t understand Mom/Grandma/Aunt Ethel/ etc…” and literally complain about how said family member has some sort of struggle THEY don’t have, so they have no clue why ANYBODY does. As if said family member is willfully doing this to themselves, and is a GREAT inconvenience to the “normal” people. Learn compassion and empathy, or leave the care to somebody who has some. That is all. Make quality time with the goddess in distress. Don’t just go do errands and or appointments, aka “good deeds” or “duty”. While all of that is important, do not forget your goddess needs to be treated as a normal person and she wants to spend time with you. Have a cup of coffee and birdwatch together. Go for lunch. Go feed the ducks, or hit the movies. Enjoying life should not be forgotten just because the goddess is in distress! Don’t just do good deeds for the goddess in distress when it is socially acceptable to do so- like birthdays or Sabbats, or mainstream holidays. People need love and care year round, not just when you get a reminder because of the time of year it is. Give her gifts. I don’t just mean candles or incense lit on your altar. I mean give things to human beings who are struggling. Say you have an elderly neighbor who used to grow tomatoes, but can’t anymore. Give her some of yours from your garden as often as possible. Say you have a disabled neighbor who likes to go to the park. Take them. Say there is an old decrepit neighborhood stray cat. Give it treats, food, shelter, love, and take it to the Vet …unless you can find a way to have it adopted, of course! Never stop looking for a way to venerate the goddess through the lives of her creatures. There are opportunities constantly. Keep your eyes and ears open. Ask for guidance regularly, and then just remain open to her call and vice. May Imbolc bring new beginnings for you. May the weather be gentle, and the Winter Hag spare you in the days before she becomes Brigid. May the goddess appear before you in her splendor, and may you be aware, and know what to do to help when she is reaching out to you in a distressing disguise.